This policy governs the use of all University trademarks (as described in Section 1.1) for any purpose and applies to the entire University. A cohesive and consistent visual identity presents a sense of unity, builds awareness and pride, and strengthens the value of our trademarks and our ability to protect them from unauthorized use. To ensure everyone associated with the University presents a consistent appearance in external and internal marketing and communications materials, it is imperative that all materials bearing University trademarks comply with the graphic identification standards. This policy applies to all official (as described in Section 2) external and internal University-related materials, describes required standards, and specifies when they must be followed. More specific information can be found in the "The University of New Mexico Brand Style Guide," which is available at brand.unm.edu. Units should consult with the University Communications and Marketing Department (UCAM), as needed, to clarify whether a proposed use is permissible and for assistance with adhering to and implementing the standards. For the purpose of this policy, a “unit” is defined as any official University entity, including schools, colleges, branch campuses, hospitals, clinics, centers, departments, offices, laboratories, institutes, programs, divisions, initiatives, and affiliates. For the purpose of this policy “University trademarks” are defined as all words, logos, or symbols used to identify or distinguish goods or services as coming from or being affiliated with the University, whether or not they have been registered with the U.S. Patent and Trademark Office or any other authority. University trademarks include the seal, the wordmark, the monogram, the mascot, and spirit marks. The term also includes the University colors, though not every use of one or both of those colors constitutes use of a University trademark. Each year the University publishes hundreds of brochures, posters, magazines, advertisements, and other printed and electronic materials for external and internal distribution. These cover a broad spectrum of subjects and meet a variety of requirements. For these publications to make a cumulative impact for the University, they must have design unity. To achieve this unity, detailed standards have been established and are available at brand.unm.edu. The University does not intend that every publication look the same, only that each publication has common elements that show it is part of the University. Any information, whether in print or electronic form, published by a University unit is considered "official" and is subject to the requirements of this policy. Information published by student organizations or by individual faculty, staff, or students is considered "unofficial" and may not carry the University logo, seal, or mascot without prior written approval from UCAM or UNM’s Trademarks & Licensing Administrator. Specific visual style guides can be developed for individual units to better meet their needs. All such visual style guides must be developed by UCAM and adhered to by their respective units. Stationery includes printed letterhead, envelopes, and business cards. Stationery must comply with the graphic standards of this policy. Official University stationery will use the University logo as described in Section 4 below. Other marks may not be printed on University stationery, except business cards. For more information on mailing standards, contact UNM Mailing Systems or refer to UAP 6340 ("Postal Services"). Official University stationary must be printed by a University approved vendor. Electronic mail and attachments that use the University logo must comply with all aspects of this policy. "The University of New Mexico is an Affirmative Action/Equal Opportunity institution. In accordance with the Americans with Disabilities Act, this material is available in alternate formats upon request." All major institutional publications should also contain the reference "The University of New Mexico has been fully accredited by the Higher Learning Commission since 1922." When addressing audiences familiar with the University such as faculty, staff, alumni, students, and community members, always use the letters UNM, which should appear with the letters capitalized and without periods between the letters. The abbreviated name is the preferred choice for brand recognition. If pieces of a document are intended to be separated, such as tear-off mailers, each piece should also contain the abbreviated name or full name. When addressing audiences that might not be familiar with what the abbreviated letters stand for, the University's full name is used. In titles, addresses, and other instances where the name stands alone, "The" in the title is always used and capitalized, i.e., The University of New Mexico. In an address, the name of the University is listed above the name of the unit. When the name is used in a body of text, "The" may be lowercase or dropped entirely, as appropriate. After the name has been used in full within a given body of text, it can be subsequently called the University or UNM. A capital “U” is necessary when using the word university to represent the University of New Mexico specifically. The name of the University in Spanish is "La Universidad de Nuevo Mexico." After the name has been used in full within a given body of text, it can be subsequently called "la Universidad." The abbreviated name, UNM, may also be used. The University logo is in the form of a monogram, a bold mark rooted in the University’s history. It is used in conjunction with the University's full name and with the names of individual units. The logo should be used on stationery, publications, and other materials, whether in print or electronic form, that represent the University to external and internal audiences. Units may not alter the University's logo or create their own logo; they may use either the University's logo or their unit logo with the specific adaptation outlined in Section 4.8. When addressing audiences familiar with the University, such as faculty, staff, alumni, students, and community members, always use the standalone monogram logo rather than the monogram logo with the University’s full name. When addressing audiences who might not be familiar with what the monogram logo stands for, always use the monogram logo that includes the University's full name. The logo for all University units will use the cherry (PMS 200) and Lobo gray (PMS Cool Gray 10) logo format. The only exception is when the Health Sciences block logo is used. Otherwise, turquoise may not be used in any part of the University or unit logos. All current University documents must comply with this standard by December 2021. If these colors are not appropriate for the particular publication, black and white logos are available as substitutes. The logo must not be altered or distorted in any way. The logo should not be combined with another emblem or symbol. Type should not touch the logo or be superimposed over it. Only images of the logo that are of reproduction quality may be used. The logo must be produced by an officially licensed vendor unless written approval is received from UNM’s Trademarks & Licensing Administrator. The logo is a registered service mark of the University. It must be properly presented and used for approved purposes only. The University licenses its trademarks, verbiage, service marks, and logos and provides for the enforcement of its license agreements. All marks and verbiage must be printed by an officially licensed vendor, including all internal purchases made by University departments, faculty, official student groups, club sports, and other units. Units with questions regarding the use of the logo on manufactured items can visit brand.unm.edu or can contact the UNM Trademarks & Licensing Administrator. University documents and forms distributed to external audiences, such as University applications, should include the University logo as an identifiable graphic or the University’s name on the front page. The University logo should always be used in institutional or unit advertising. If a unit has special design requirements for advertising, the unit should contact UCAM. In general, the University logo should appear by itself, and not with other logos. However, when the University is allied in a cooperative venture with one or more other organizations, it may be appropriate to place the logos of these other organizations on the same page with the University logo. When this is done, the University logo should be larger than the other logos or all logos on the page should be the same size. A consistent logo format is used to represent all University units. The style includes a cherry (PMS 200) monogram to the left or above the official name of the unit in Lobo gray (PMS Cool Gray 10). Abbreviations and acronyms are not permitted. White and black logos are also available. Unit logos requiring two unit names (a parent unit and sub-unit) may be used to show unit relationships. This format includes a parent unit name in Lobo gray (PMS Cool Gray 10) above a cherry (PMS 200) line. The the sub-unit name appears in smaller font below the line. Unit logos may only be designed by UCAM. In very limited circumstances as defined in the The University of New Mexico Style Guide, a unit may use an alternate logo. If a unit wants to use an alternate logo as a graphic identifier, the unit must send a written request, which must include a formal proposal demonstrating a business need for the alternate logo, to the Visual Identity Committee. Requests are reviewed on a case-by-case basis. Whenever an alternate logo is used, the official University logo must also be used. The University logo should be larger than the other logos or all logos on the page should be the same size. The most formal symbol of the University is the official seal, which is addressed in RPM 2.7 (“Use of the University’s Name and Symbols”). 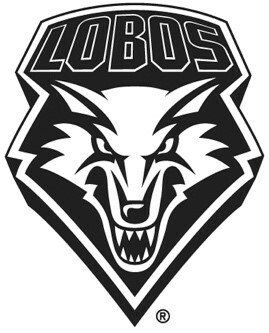 The Lobo, or Mexican Gray Wolf (Lobo), is the official mascot of the University. Only officially approved images of the mascot that are reproduction quality may be used. These images and approval to use them must be obtained from the UNM’s Trademarks & Licensing Administrator. The Lobo is a registered service mark of The University of New Mexico. It must be properly presented and used for approved purposes only. Units with questions regarding the use of the Lobo on general use and manufactured items should contact UNM’s Trademarks and Licensing Administrator. The official colors of the University are cherry (PMS 200), silver (PMS Cool Gray 6) and Lobo Gray (PMS Cool Gray 10). The UNM Health Sciences Center’s primary brand color is turquoise (PMS 321). Units must use the University's official color palette in publications. If a violation of this policy is identified, units will be required to work with UCAM to determine the action needed, which may include redesign of print and/or electronic materials. With respect to all violations of this policy, the University reserves its right to seek appropriate remedies under applicable federal or state law. Exceptions to this policy must be approved, in writing, by the University Marketing Director in UCAM and UNM’s Trademarks & Licensing Administrator.